This coming Saturday a parade of people will march through the streets of our nation’s capitol, and many other cities and towns, including Seattle, led by a bunch of kids – sadly dubbed “the school shooting generation”. In their “March for our Lives” these virtually powerless children and their families are standing up to the powerful to say “Enough!” to gun violence, and to demand change. It is heart-wrenching and awe-inspiring to watch these articulate and tech savvy youth put into action their promise to stop at nothing. I don’t know anyone who expected this. These kids are heroes. May God grant them wisdom, and safety. It is not lost on me that the next day, as Lent wraps up, we will recall another parade that took place on Palm Sunday, this one too comprised of a seemingly powerless group. 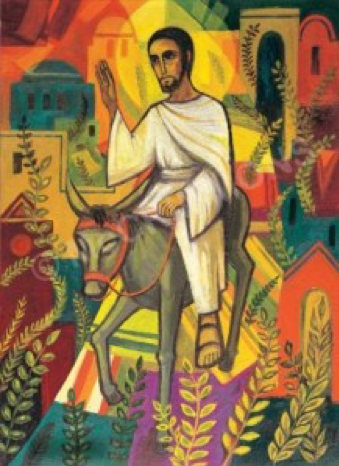 All four gospels give us a snapshot of Jesus riding into Jerusalem, Israel’s holy city, astride a young donkey. I picture Jesus’ awkward posture, his feet dragging in the dust. The visual just seems rather comical; it’s difficult for us to appreciate the deep political overtones here, and even the argument for an end to violence. Indeed, this Palm Sunday parade is THE MARCH THAT CHANGES EVERYTHING. For Jesus is on his way to the cross, to turn the world upside down. He will stop at nothing – not even death – to turn the imperial notions of power and rule on their head. “The inconvenient truth is the historical church has often not only contributed to the erasure and oppression of [various] groups…but instigated it. Please note: Our lunch on Easter will be less “substantial” than usual – just sweet breads and cookies – to allow time and space for members of the congregation to gather for meals with their families after worship.